One of the greatest new components in Crosslight 4 is a powerful, full-fledged Charting component, enabling Crosslight developers to easily add stunning charts to their business cross-platform mobile apps. Fully MVVM capable, it works beautifully across iOS and Android platforms. To start off, create a Blank Crosslight project with Crosslight Project Wizard. You can do this from the Visual Studio's New Project menu and select Visual C#, Crosslight. After the project is created, don’t forget to add the necessary references as well. Core project: Add Intersoft.Crosslight.UI.DataVisualization assembly. 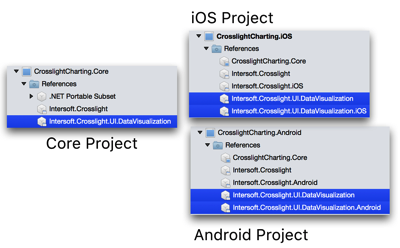 iOS project: Add Intersoft.Crosslight.UI.DataVisualization andIntersoft.Crosslight.UI.DataVisualization.iOS assembly. Android project: Add Intersoft.Crosslight.UI.DataVisualization andIntersoft.Crosslight.UI.DataVisualization.Android assembly. For the sake of simplicity, the above sample uses static data points as the items source for each series. If your data points are heavily reused across your application, you can refactor the data points into a repository or data manager class which you can easily consume with a simple method call. Now we are done initializing the chart in the ViewModel and populated two ColumnSeries, also added the data points for each series which will be displayed side-by-side. Crosslight Charting library includes component models that you can consume in the shared Core project. The Chart model represents the data source required for the chart, and also provides a wealth of chart configuration and settings. 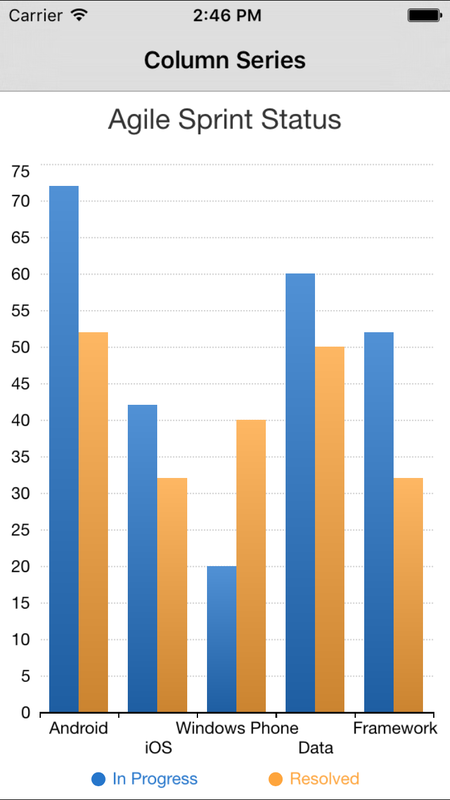 The Series, ColumnSeries, and DataPoint are another example of the component models available in the Charting library. It’s also worthy to point out that changes to the Chart model will automatically propagate to the view, this means you can add or remove Series dynamically when the app is running. The changes you made to the Chart model will not be only propagated to the view, they will be also smoothly animated from the current point to the new point without the need of additional codes. 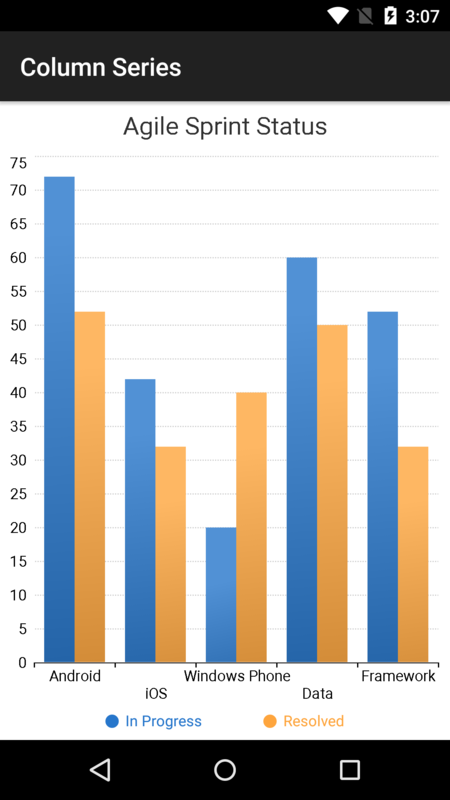 Also, you don’t necessarily need to define the dependent and independent axis for the chart, since Crosslight Charting comes with automatic axis detection that generates meaningful axis and range, purely based on the given data. You can also set the items source of the Series later in the app’s cycle, such as after fetching data from the server in most real-world scenarios. For your reference, here’s a code snippet how to initialize the items source of a Series combined with an async data load. Since our ViewModel and Chart model is ready, we will need to prepare the Binding Provider which will bind the ChartView to the Chart property of the ViewModel. You also need to subclass the UIChartViewController class. The UIChartViewController provides a ChartView property which returns the instance of UIChartView that it manages. It also automatically registers the ChartView as an identifier, allowing you to easily bind to the chart view in the binding provider. Similar to iOS counterpart, you can reuse the ViewModel and BindingProvider to create an Activity. 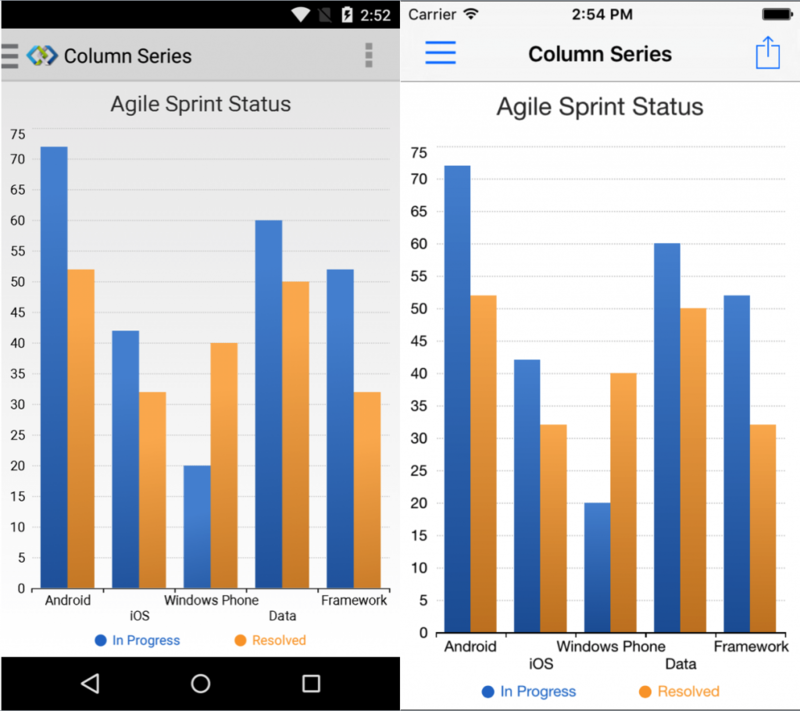 Create an activity named with ColumnActivity, and put it inside the CrosslightCharting.Android/Activities folder. The layout is simply a ChartView that covers the entire screen with a white background to get better visibility of the chart. Using Crosslight Charting will create the axes and fit into the screen automatically, also the legend is automatically generated for you based on the given data points.